Chicken Knish (Trial #1) | Cooking is Fun … Really!! 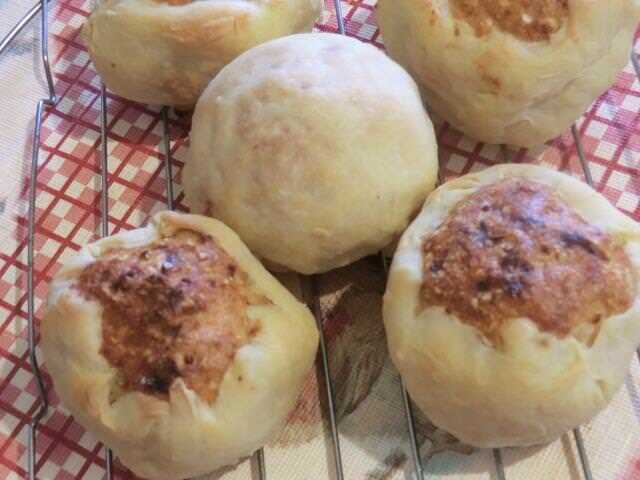 I’ve been meaning to make a batch of knish for some time … years actually. But something always got in my way. I’m home sick today so I pulled a half pound of raw, cubed, chicken breasts out of the freezer, thawed it enough so I could mince/grind it up in my food processor and made what was the easiest dough/filling recipe that I found in my internet searches. I should have had my suspicions when there were no reviews posted. Oh, well. You live and learn. 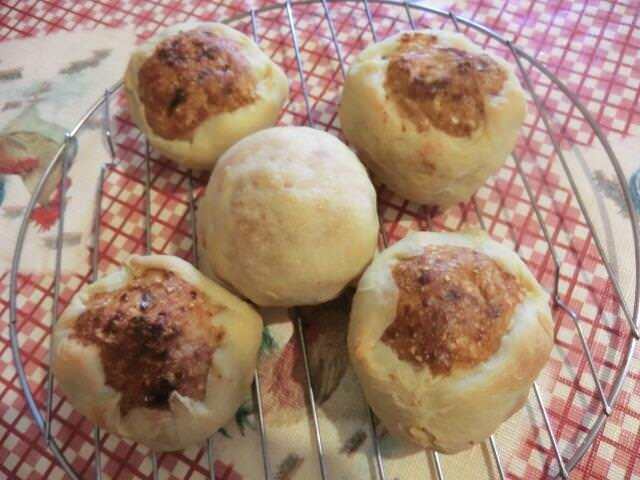 The recipe wasn’t a complete FAIL and the knishes tasted alright, but there were some issues. The dough – Very soft and wet. I kneaded in some more flour before oiling the plastic wrap, wrapping the dough up in it, and then refrigerating the dough while I made the filling. The filling – I eyeballed a ‘cup’ of chopped chicken breast to equal about 1/2 lb/227 gm and froze it away a couple of days ago. However, the directions (1 tbsp of filling) seemed … off. And it was. A cup comes out to about SIXTEEN tablespoons, even if you ignore the contribution from the small grated carrot and chopped onion. So, did that mean I was to roll out sixteen circles and fill them? The problem was that I didn’t have a HOPE of rolling out that miniscule amount of dough thin enough in order to do so. I rolled out the dough about 1/8th of an inch thick and was able to cut out four (3 3/4 inch) circles. 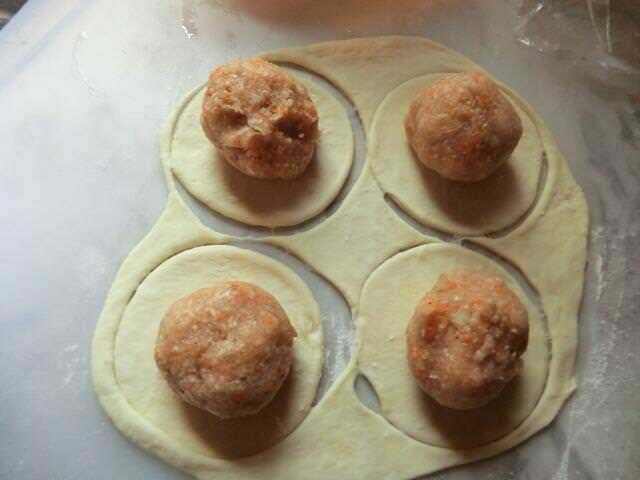 I divided the filling into four portions and shaped them into balls which I placed on top of each of the circles of dough. Picking the knishes UP was another problem. And the dough was SO soft and sticky that wrapping it around the giant ball of filling was almost impossible as it kept tearing. I was determined to succeed however. Because I’m FRUGAL and didn’t intend to discard the trimmings from the dough, I gathered them up and roughly shaped and rolled them out into a FIFTH circle of dough. 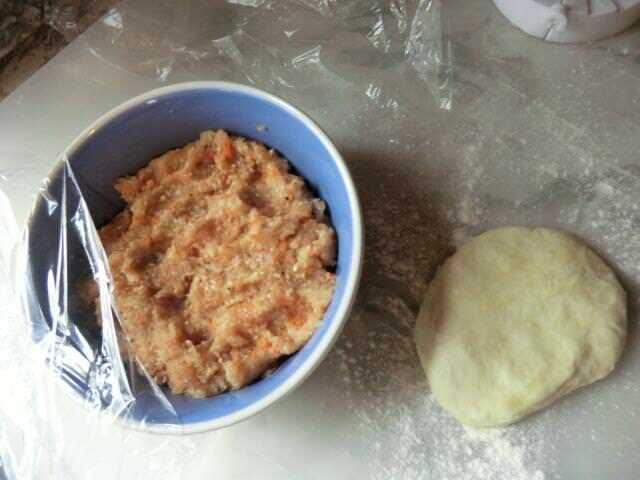 Then, I re-portioned the chicken filling so I could fill all five of the knishes. I floured my hands and shaped the knishes as best as I could. The last knish was shaped a bit differently as I wrapped the dough completely around the meat filling. The baking temperature – I did a fast conversion of the baking temperature (180 deg C /~350 deg F) but realized that the dough wasn’t getting as brown as I wanted in the time suggested, so I increased the temperature to 375 deg F, for the last 15 minutes. And then I baked the knishes for another 10 minutes. I even turned on the broiler for a few minutes but they were still pale. The knishes were baked on a dark metal baking sheet lined with parchment paper and the bottom was lovely and brown. It was also HARD. The sides though were nice and tender, even if pale. The filling was moist and bouncy, so it was not over-baked. Even without any dipping sauce (Dijon mustard or ketchup), the knish I ate was very tasty. Get well soon. I’ve never heard or read of knishes before. It’s a Jewish dish. My mother learned how to make them while working in a Jewish deli. She didn’t make them at home for us and the ones she brought home were filled with ground beef. Thank you. They sound delicious. I know very little about Jewish cuisine. Hope you feel better soon, it’s a terrible time to be sick, just before the holidays. The knishes look pretty good, glad it wasn’t a total fail. I stayed home Thurs and Fri cause I wasn’t doing myself any good being at work and miserable. I’m feeling better today on Day 5. Still coughing, though, which is a pain. I’ve had Knish on my list for a long time, too! I make lists of what I want to make but then my food ADD gets the best of me and I guess I just live in the moment! It is something I’d like to master! 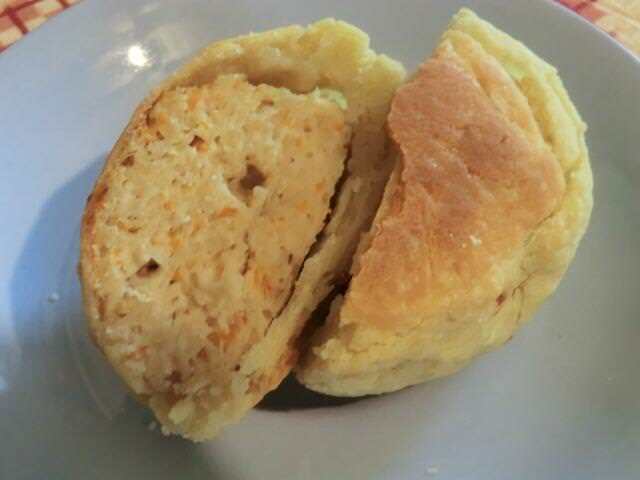 I’ve been seeing a few Delis featured on Diner’s Drive-Ins and Dives and they invariably have Knish and it makes me want it so much! There are a number of Jewish dishes that I still want to make … kreplach being one of them. Sort of a soup perogie. My Stepmother’s grandma, who she grew up with was from Poland, not Jewish, but I see some of the dishes she’s mentioned at Jewish delis. She had kind of a hatred of some of that food or else I probably could have learned a lot from her. It”s funny because most people I have known seemed to like reliving some of their childhood meals. My Mom sure did before she passed. lol! There is that!! Maybe you could help me – there was one dish that Pat talked about all the time. She pronounced it kind of like kneigli and zewelicky I think. It was some kind of dumpling or noodle and meat dish. Maybe even liver. Does that ring any bells? There are several different types of ‘dumplings’ in Eastern European cooking. The names vary among the different countries. The first name kneigli sounds a lot like nokedli/spaetzle. But I think you’re probably looking for something like this. It was the liver that gave me a clue. LOL … languages/pronounciation. It’s amazing how some things end up sounding.